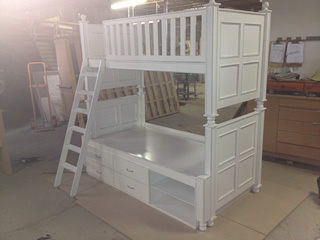 L Shape Bunk Bed can be placed in a corner and has a bookshelf. Longer Legs so bigger space between bunks. Can only be placed one way in a corner. Made out of a Combination of Pine and MDF. FROM SPACE AND FUNCTIONALITY POINT OF VIEW A DOUBLE BUNK AND BOOKCASE SEPERATE IS A BETTER BUY.